We continue the Find Your Park in our backyard series this month, featuring the Harpers Ferry National Historic Park. 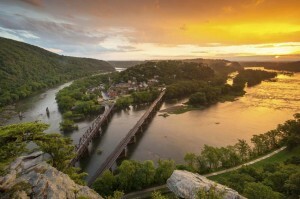 The historic town of Harpers Ferry is located at the confluence of the Potomac and Shenandoah Rivers in West Virginia. Each year nearly 500,000 visitors come to experience the cultural and recreational attractions of Harpers Ferry. Around 1750, Robert Harper, an early settler to the area was given a patent on 125 acres at the present location of the town. By 1761 he had established a ferry across the Potomac, which made the town a starting point for the flocks of settlers coming into the Shenandoah Valley and points west. In 1763, the Virginia General Assembly would establish the town of “Shenandoah Falls at Mr. Harper’s Ferry”. 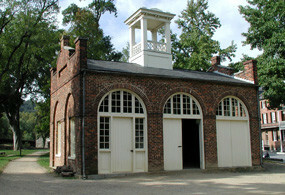 Robert Harper’s original house is the oldest remaining structure in the lower part of the park. The town grew as new Americans moved west, and in 1783 Thomas Jefferson visited Harpers Ferry. When he climbed to the heights overlooking the town he stood on a rock, which bears his name today, and was so impressed he wrote that, “this scene is worth a voyage across the Atlantic. As a new nation looked to the West, the the power of the rivers came under the view of George Washington who choose Harpers Ferry as the site for a US Armory. With the construction of the US Armory and Arsenal the town quickly became an industrial center. In 1803 Meriwether Lewis traveled to Harpers Ferry to procure the weapons and equipment he would need for his transcontinental expedition. By the 1830’s both the C&O Canal and the B&O Railroad had reached Harpers Ferry, connecting it with Washington D.C. and the growing cities to the west. Today visitors can explore the old US Armory site, see the remains of the Industrial Revolution along the Virginius and Halls Island trail and tour the Industry Museum. As the nation grew so did the divide over slavery. In October 1859, abolitionist John Brown attempted to initiate an armed slave revolt by capturing the armory. Although Brown’s raid failed, the issue of slavery was brought to the forefront and would propel the country toward civil war. Due to its strategic location, Harpers Ferry would change hands several times between the North and the South during the war and it would play a significant role during the Maryland Campaign. After the Civil War, Harpers Ferry would be in the front line of the civil rights movement. Storer College was founded on Camp Hill, as part of the Freedman’s Bureau, to help educate the thousands of freed African Americans. In 1906, Storer College would host a conference of the Niagara Movement, an effort to eliminate discrimination based on color. The Niagara Movement would lead to the foundation of the National Association for the Advancement of Colored People (NAACP) which continued the fight against discrimination and segregation. In 1955, Storer College would close its doors after the 1954 US Supreme Court decision in the Brown v. Board of Education case which ended public school segregation. Today the campus is used as a training center by the National Park Service, named in honor of its first director – Stephen Mather. 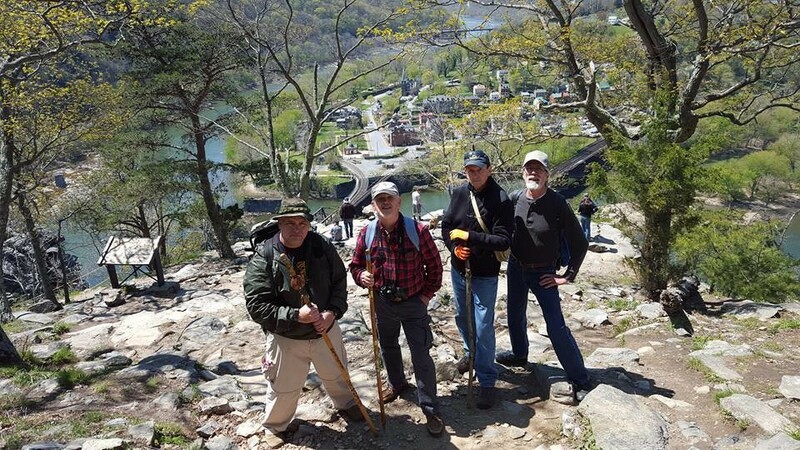 With over 20 miles of trails, Harpers Ferry is one of the best walking parks in America. Trails will take you through the restored town, along the scenic Potomac and Shenandoah Rivers, and through the beautiful Blue Ridge Mountains. From Harpers Ferry you can hop on the the C&O Canal Towpath to bike or just stroll along the river. 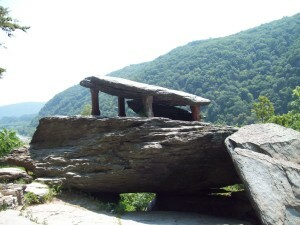 Hikers can also pick up the Appalachian Trail for a day hike. The Lower Town offers a number of museums, exhibits and historic sites for visitors to see with great shopping and restaurants nearby. 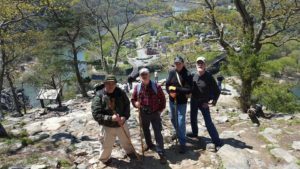 Now get out and Find Your Park – Visit Harpers Ferry!